The New York State Energy Research and Development Authority (NYSERDA), which manages the states Renewable Portfolio Standard (RPS), has recently released reports regarding the program. The RPS sets targets (25% by 2013, 30% by 2015) for the portion of New York’s energy mix deriving from renewable resources including wind. New York Renewable Portfolio Standard, Program Evaluation Report, 2009 Review of March 31, 2009. The report presents key findings and recommendations provided by KEMA, Inc. and Summit Blue Consulting, LLC in their role as independent evaluation contractors. Findings are based on the scope and timing of the research conducted by the contractors, and the recommendations provided are not necessarily being advanced by NYSERDA or DPS Staff. The wind potential in New York is being developed at a pace exceeding other states with more abundant wind resources, indicating in part, the Program’s positive influence on wind development. The evaluation concluded that the RPS Program is being administered efficiently and with due diligence concerning ratepayer funding risks. Nevertheless, currently approved funding levels are inadequate to meet the 2013 targets. The RPS Program has cost-effectively achieved new renewable energy capacity in New York. The Main Tier is highly cost-effective with a program administrative benefit-cost ratio exceeding 6 to 1. The specified benefits include investment and wages in the New York economy, electricity price suppression at the wholesale level, and environmental benefits in the form of avoided air pollution emissions. The specified costs include NYSERDA’s cost to administer the program and the payments to developers under contract for RPS Program attributes. The assessment finds that New York’s RPS has played a critical role in advancing renewable energy markets in the State to date. In particular, long-term contracts offered under the Main Tier program have proven valuable in driving the development of large-scale projects in the State. However, budget limitations and other program design elements, as well as market barriers beyond the State’s control, will limit market growth potential going forward. A number of actions NYSERDA and the State should consider taking to advance New York’s renewable energy markets in the future are recommended. Press release 4/20 here. New York should consider alternative forums for working with wind and demand response providers to develop new solutions to transmission and distribution congestion issues. A starting point for this may be facilitated meetings on future transmission impacts, participation in the dayahead market and assignment of dispatch base-points for wind operators. This entry is not directly related to wind energy. For those who would be disappointed, please read no further. Rather, this entry deals more generally with smart energy choices. In an effort to put my money where my mouth is, and with familial support, this blogger is attempting to use smart grid technology to make his energy use choices, well, smarter. It describes, in reverse chronological order (i.e., most recent first), my efforts to obtain and use a smart meter for electricity consumption at my house. Times Union piece discussing redaction of large parts of National Grid’s PSC filing on its smart meter plan. I have executed and mailed to National Grid the contract described below. National Grid mailed on this date, and I received soon thereafter, a letter inviting me to participate in smart metering program, and a one-year contract. The big concern I have is that the letter says that participation will likely result in savings if my usage is greater than 2500 kwh per month (and I can shift 80% of it to off-peak times). As indicated below, the initial bill insert suggested I may receive savings if my usage were 750 kwh per month and I could shift 12% to shoulder peak and 80% to off-peak times. (My usage is around 1100 kwh per month.) Boy do I need a spreadsheet. I spoke with the accounting supervisor this am. She will pull your request to the top of the pile. The new meter set will be ordered today. We have to ship the new meter in from Syracuse. Once the meter arrives in Albany our Service Department will complete the change out. On another note.. The 750kWh monthly would be the minimum. Our phone reps are told to be somewhat conservative in their approach to this rate. Not all people are so willing to shift their consumption patterns as you are. Thanks for your patience on this matter. I have been asked to follow up on your recent rate change to SC-1C for your home account. I have a call into our accounts processing department for an update on the status of your request. I do see that you made the request back on 2/22/09. Once the supervisor gets a chance to investigate, I will let you know when the change should be completed. In the meantime should you have any questions please feel free to contact me direct at [number redacted]. Make sure you use “Capital” as the load zone. Select rate SC-1C and the dates. You will see the on and off peak pricing for commodity. 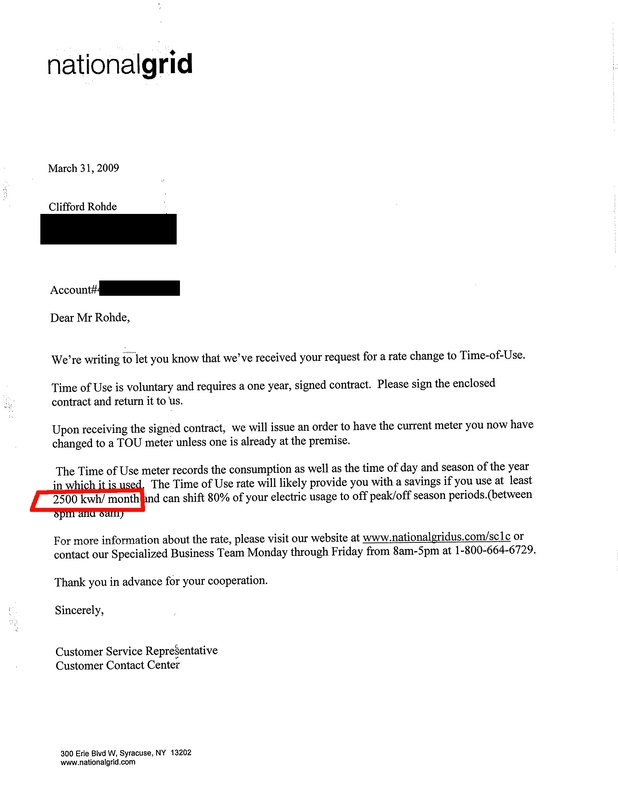 I’ve responded indicating that I am interested “in knowing what your estimate is of what usage level (assuming the requisite shift to non peak hours) makes participation economical for the household” as there appeared to be a disconnect between what my bill said and what the representative I spoke with on February 22 said. As the first comment below indicates, National Grid responded within 7 hours of this posting. Very much appreciated. March 26, 2009: Not smart metering yet. 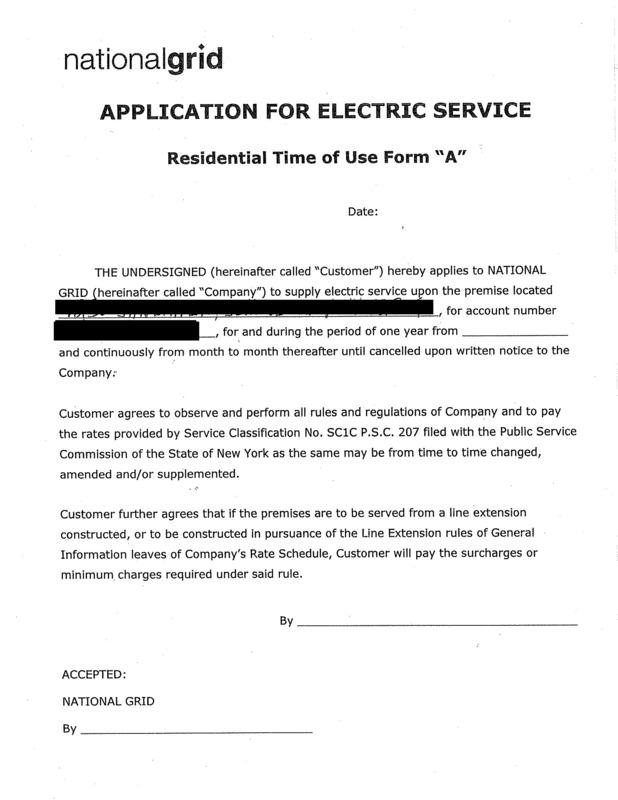 I recently received a bill (see redacted copy below) from my electricity provider, National Grid. 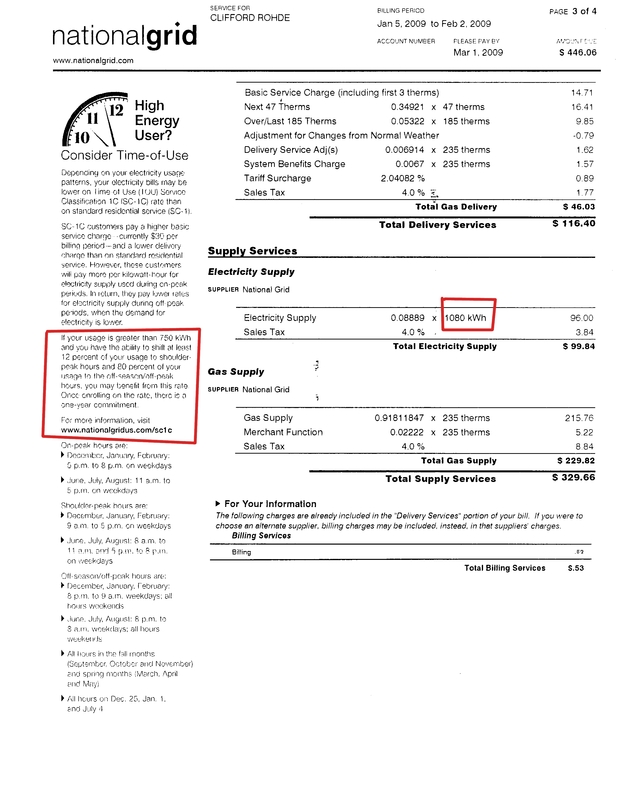 The bill indicated that if my usage were over 750kWh, and I could shift at least 92 % of my usage to non peak (12% shoulder peak, 80% off peak) hours, I “may benefit” from the smart meter rates. That is the crux of the smart meter “win” for consumers. If you can use energy during times of low demand, you should pay lower rates for the juice. It’s a “win” for the grid and everyone else, too, as it reduces strain on the system during peak times. Review the peak and non-peak hours in the bill below and the logic will jump out at you. I attempted to visit the website location indicated, http://nationalgridus.com/sc1c. No luck there (though I was able to find some smart meter rate information by poking around on the site). So I called National Grid, on or about March 7 [actually, February 22 per National Grid – see above]. Maybe a week earlier. The person who attended my call was helpful, though did not know much about the program. The information she had suggested I would need to have more than 750 kWh in usage to realize savings, but it still seemed possible, especially considering what I know, or think I know, about my electricity consumption habits. She knew I would need a new meter on my house. She said she would pass my information along to the right person, who would contact me to get the new meter installed. If you have a smart grid/ smart meter story from New York, either pro or con, please leave a comment here. In the meantime, you may want to read about the use of existing wireless networks for the smart grid system, the savings in energy consumption a smart grid can generate, Google’s foray into the smart meter space (and brewing turf war over who owns or controls the smart meter data). More on Governor Paterson’s apparent interest in scaling back the 10-state Regional Greenhouse Gas Initiative (RGGI) to reduce carbon emissions. Albany Times Union 3/23 More on RGGI here at NYSERDA’s website. New report released by the Ernest Orlando Lawrence Berkeley National Laboratory and National Renewable Energy Laboratory for wind developers. The purpose of this report is to both quantitatively and qualitatively analyze, from the project developer/owner perspective, the choice between the PTC and the ITC (or equivalent cash grant) for a number of different renewable power technologies. NYISO announces that for first time ever, wind power contributes 1,000 MW to the grid, at approximately 6:00 p.m. on February 19. NYISO, 2/26. See related opinion piece in Albany Times Union, 3/1. Interesting study out of Stanford University by Mark Z. Jacobson, a professor of civil and environmental engineering. Study online at the Journal of Energy & Environmental Science. Three-minute video of Prof. Jacobson discussing results of the study here.